For whatever reason, the store shelves in my area are just inundated with all kinds of branded freezer pops this year. 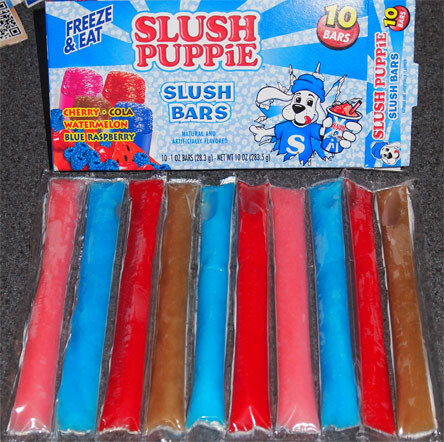 I've seen popsicles from baskin-robbins, jolly ranchers, and the slush puppie ones below just to name a few. I was hesitant to try them with their icky ingredient list... but when I spied this 10 pack for a dollar at walmart, I decided to give in and try them. So I've tried all the flavors and the good news is there is a familiarity to them, especially the cherry and blue raspberry. Basically they've gummed up the ingredient list to give a bit of slush-like solidness to the product. This isn't just frozen ice. There's that bit of slush texture to them which is neat and definitely gets your attention. Disclaimer: I'm not saying these are new since Junk Food Guy reviewed them way back in the fall of 2011, but they are new to me... Whoa. Technically these date back to at least 2009. Both of those reviews were just blue raspberry and cherry, so the four flavor thing is fairly new at least. You know what? I wish they still had the two pack because the cola flavor is weird (almost peppery) and I've got zero desire for a watermelon slush puppy (not that it's completely terrible).